The drawing group is a relaxed company of artists. Conversation turns to discussions, like getting to know the models we draw, movies, art, politics just to name a few topics. 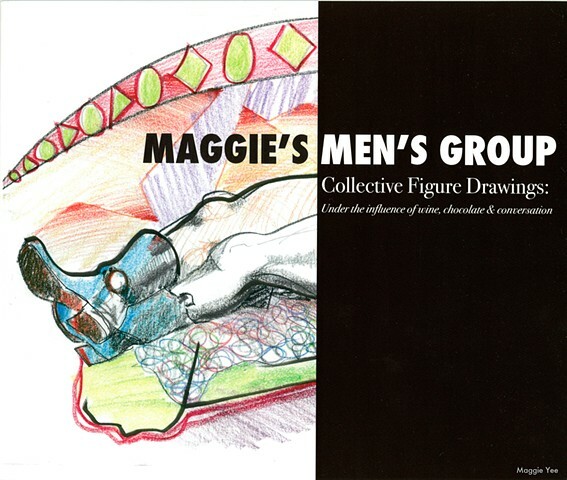 Oh, and Maggie’s inquiry about the men artists in our group and their Men’s Group. Maggie never belonged to a women’s group or any other group. The drawing group is her group. Joking around, “Maggie’s Men’s Group” stuck. We decided to make our evening of drawing a little more playful. We call it a number of things, round about, go around, … ? Anyway the process is all the artists go around twice and draw on each other’s sketch book for 2 minutes while the model holds her pose. The result of the finished drawing is a surprising coming together of the minds, personality and bits and pieces of the night's conversation. Each artist would bring their favorite sketching implements and paper to the group session. Paper included pads of standard drawing paper, newsprint, tinted and recycled paper. Sketching tools varied with each artist. Bob McKim would sketch with pen and ink. Debbie Simpson worked with pastel and chalk. Maggie Yee used a “printer’s paper sampler” pad with various dry media that allowed the paper texture to show through. Francis Padillla used his signature black charcoal. When the collaborative drawing process first began each artist used a simple medium, such as a black marker, graphite pencils and charcoal. This resulted in mainly black and white drawings. When this process was used, each artist’s choice of media and style was easy to identify within the collaborative drawing. At some point colored pencils were introduced. As the process developed and continued, the drawings appeared to be more cohesive and the use of different media and the differing drawing techniques seemed to enhance the drawings and making it more difficult to distinguish between artists.